Sri Lanka spinner Muttiah Muralitharan bamboozled New Zealand to send the 1996 champions to the World Cup final with a 81-run victory over New Zealand in the first semifinal here today. Sri Lanka captain Mahela Jayawardene chose to bat and struck an unbeaten 115 to lead his side to a daunting 289 for five at Sabina Park. Can Smith men halt Aussie storm? South Africa will have to shed their burden of history and perform out of their skin to halt the unstoppable march of Australia as the two teams square off in an epic semifinal showdown of the World Cup tomorrow. Emotions will run high as world's top two cricketing nation once again slug it out for a place in the final. South Africa had grabbed the number one ranking from the Australians last month; chased down 434 at the Wanderers last year and will be now on a mission impossible to stop Australia's winning run of 26 matches. You do not have to be a die-hard cricket fan to pronounce that Australia are expected to win today’s semifinal. The way they have played in the competition, they do not seem to be bothered by concepts like the ‘law of averages’. South Africa will take aim at Australia’s strongest area by targeting their top order batsmen in their semifinal on Wednesday, skipper Graeme Smith said. The Indian cricket team's new manager and coach would be appointed for a tenure of two years, the BCCI disclosed today. 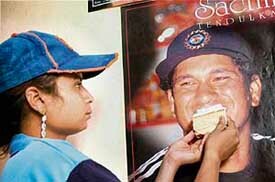 Sachin Tendulkar, an integral part of the Indian squad in all forms of cricket till recently, today celebrated his 34th birthday with the knowledge that his glittering career is at the cross-roads. The policy of rotating and giving rest to senior cricketers must be done with great care since no player likes to be out of the Indian team, former chairman of selectors Kiran More has said. Women hockey players from this sleepy township are in a joyous mood as a European club has approached them to play in the European league. A week of inactivity after many weekends of below-par golf saw Jeev Milkha Singh dropping out of top 50 in the latest official world golf rankings. National Football League champions Mahindra United went down 1-2 to Hong Kong’s Happy Valley in their AFC Cup match today. World's youngest Grandmaster Parimarjan Negi came a cropper against GM Emanuel Berg of Sweden and went down in 43 moves to register his third loss in six rounds of Sigeman and Co Chess tournament here. Trials to pick Punjab probables for the under-21 national football meet will be conducted at Guru Nanak College, Phagwara, on April 26 at 7.30 am, according to Arjuna awardee Inder Singh, secretary, Punjab Football Association. Players born on or after January 1, 1987, are eligible. Sri Lanka spinner Muttiah Muralitharan bamboozled New Zealand to send the 1996 champions to the World Cup final with a 81-run victory over New Zealand in the first semifinal here today. Sri Lanka captain Mahela Jayawardene chose to bat and struck an unbeaten 115 to lead his side to a daunting 289 for five at Sabina Park. A stunning opening spell from unorthodox paceman Lasith Malinga then put New Zealand on the back foot before Muralitharan took four wickets, including three in six balls, as the Kiwis crumbled to 208 all out in 41.4 overs. Australia play South Africa in St Lucia on Wednesday for the right to face Sri Lanka in Saturday's Barbados final. New Zealand have now lost in five World Cup semi-finals. Earlier, Mahela Jayawardene hit his maiden World Cup hundred to help Sri Lanka post big total. Jayawardene’s masterly 115 not out ensured the 1996 winners overcome a mid-innings stagnation and finish with a flourish after electing to bat at the Sabina Park. The right hander showed cricketing acumen in gauging the pace of the wicket and maturity in pacing the knock while cracking 10 fours and three sixes from just 109 balls. His brilliant late burst saw the Lankans plunder 102 runs from the last 10 overs for the loss of just one wicket. Opening batsman Upul Tharanga earlier compensated for the cheap dismissals of Sanath Jayasuriya and Kumara Sangakkara with a near run-a-ball 73. James Franklin with 2-46 was the only bowler to emerge with head high while Shane Bond (1-59), Jacob Oram (1-60), Daniel Vettori (1-51) and Jeetan Patel (0-62) all proved to be expensive. Besides, Jayawardene would also rue, and rightfully so, that two of his batsmen were victims of poor umpiring. Earlier, Franklin picked up two crucial wickets early to push Sri Lanka on the back foot. Jayasuriya played all over a straight delivery and was bowled for one in the third over. The left-arm pacer struck again in the 14th over when Sangakkara stepped out and played a lofted drive, only to find rival captain Stephen Fleming at mid-on. In between, Tharanga’s impressive stroke play kept the runs flowing. The left-hander deftly handled Shane Bond’s express pace, gliding him delicately to fine leg. There were also a cheeky upper-cut to third man fence off Franklin and even more pleasing shots in front of the square. Tharanga also stepped out to Vettori to loft him over extra cover for a six. The 22-year-old, however, fell to a rank bad shot, moving across to sweep Vettori and exposing his all three stumps. Tharanga’s partnership for the third wicket with Jayawardene was worth 44 runs. The Black Caps then had a lucky break when Chamara Silva was controversially given leg before wicket to Shane Bond. The right hander, who smacked Vettori for a stunning six over midwicket, was looking dangerous when Bond beat him with a sharp in cutter. South African umpire Rudi Koertzen had no hesitation in upholding the appeal but television replays showed the ball to take a huge inside edge and apparently no contact with pads. Fall of wickets: 1-13, 2-67, 3-111, 4-152, 5-233. Bowling: Franklin 9-1-46-2, Bond 10-1-59-1, Oram 10-0-60-1, Vetetori 1-0-0-51-1, Patel 10-0-62-0, Styris 1-0-8-0. Fall of wickets: 1-2, 2-32, 3-105, 4-114, 5-114, 6-115, 7-116, 8-144, 9-149. South Africa will have to shed their burden of history and perform out of their skin to halt the unstoppable march of Australia as the two teams square off in an epic semifinal showdown of the World Cup tomorrow. Emotions will run high as world's top two cricketing nation once again slug it out for a place in the final. South Africa had grabbed the number one ranking from the Australians last month; chased down 434 at the Wanderers last year and will be now on a mission impossible to stop Australia's winning run of 26 matches. But history is against the Proteas. They have twice reached the semifinals of the World Cup before but were unlucky to lose on both occasions, rather dramatically. In 1992, a flawed rain rule did a miracle for England and ruthlessly snatched a certain victory from the South African hands. While chasing 252, a rain interruption turned the equation upside down for South Africa. Their gettable target of 22 from 13 balls was revised to 22 from one ball. The 1999 tied semifinal against Steve Waugh's Australia at Edgbaston will still be fresh in the memories of at least four players -- Shaun Pollock, Jacques Kallis, Mark Boucher, Herschelle Gibbs — who were part of that epic encounter, rated as one of the best one-dayers ever. In a match of fluctuating fortunes, South Africa needed nine runs in the last over with one wicket in hand, but Allan Donald's run out tied the match. Australia scraped their way to the final on account of their another back-to-wall win against South Africa in the Super six. Harsh words are exchanged and psychological warfare extended when the two sides meet and it's no exception this time around. "The 1999 game was a game in history. It doesn't get mentioned much within the set-up," South African captain Graeme Smith said. Australia's vice-captain Adam Gilchrist, however, would beg to differ. "They will be even more determined given what seems to be a bit of a curse at cricket World Cup. I am not so sure (if they are not haunted by previous failures). Australia had the upper hand in six of their past 10 games against South Africa, including the pummelling they handed over to the Proteas in their Group match in the World Cup. But it was not drubbing all the way in the encounter at St Kitts. South Africa, chasing a mammoth 377, were on their way to make a match of it. A belligerent Smith (74) and A B d'villiers (92) gave South Africa a rollicking start but then lost their way in the middle. Australia have reached the semifinals without raising a sweat whereas Smith's men have just about made it to the last four, after losing matches against Bangladesh and New Zealand. But Gilchrist believes the equation in semifinals would be different. "They've probably not quite dominated all the teams like many would have expected, but they have done enough to get to a World Cup semi-final and that's all you set out to do at the start of the tournament," said Gilchrist. South Africa is planning though to shield Shaun Pollock from the hammering he received at the hands of Matthew Hayden and Gilchrist in the St. Kitts game. Pollock conceded 83 runs from his 10 overs while Hayden raced to the fastest century ever in the World Cup history in a mere 66 balls. Proteas are now planning to give Pollock the new ball but remove him off the attack as soon as Hayden goes after him. "We have a plan with (Pollock). I suspect he will take the new ball, but if there's nothing happening, we will probably whip him off early and go for the pace of (Andre) Nel. It is something we learnt from the last game," Arthur said. "When you get to the back end of these tournaments, you need your top players to have big games," Arthur said. "The teams are going to be quite close so it's going to be a bit of stability and a match-winning performance from one of them that could be the difference," he said. You do not have to be a die-hard cricket fan to pronounce that Australia are expected to win today’s semifinal. The way they have played in the competition, they do not seem to be bothered by concepts like the ‘law of averages’. Their players have this knack of excelling in make-or-break situations, and there cannot be a bigger occasion than the knockout stage of cricket’s biggest event. Yet, it would be unwise to discount the South Africans. Why are the Australians ruling the roost in the competition, and indeed, in world cricket? The reason is that the approach of each and every member of their national side is identical. It is unlike what we see in Pakistan and India, where the cricketers have diverse attitudes and approaches. Some players may be decent in the field, while others may be poor. Some batsmen may be comfortable with both front-foot and back-foot strokes, while others may be strong off only the front foot. If at all we need to learn something from the Australians, it is their commitment to excellence at the junior and domestic levels of the sport. They produce outstanding cricketers in such numbers only because of the hard work put in by their former cricketers and administrators at the lower levels. They do not believe in the subcontinental policy of finding ‘teachers’ for those who have already reached the international level. A player who has been exposed to quality ‘education’ earlier on will stand a better chance of succeeding at the highest level than someone who hasn’t. It’s as simple as that. What India and Pakistan ought to do is set up a group of former cricketers who will evolve an ideal coaching method. Once this is done, they could educate others in the same, and ensure that youngsters all over the country receive similar training and tips. If you hire a foreign coach, then first make him ‘coach your coaches’, who will then return to their respective academies and preach his methods to their wards. This will ensure a consistent and complementary development of cricketing skills across the land. The consistent Australians will certainly not be bothered about whether they bat or bowl first later today. They know they have the batting to score or surpass any total. They also know that they have the bowling to dent and demolish the best batting line-ups. The South Africans will not be as confident, although they too have a formidable side. Graeme Smith’s men have a tendency to struggle while chasing, and it is this that they will be worried about. What also goes against them to a certain extent is the predictable nature of their bowling attack. Their fast bowlers do a good job when the wickets offer bounce and movement, but I don’t think they will get too much of both in the semifinal of a World Cup being played in the Caribbean. The wicket in all probability will be flat and batting-friendly. Matthew Hayden is one player the South Africans would have discussed extensively. The selectors, who picked him for the tournament despite his indifferent form, deserve to take a bow. The South Africans will be over the moon if they get him early, but then, will it make too much of a difference? For the Australians are known to chip in for each other in pressure situations. Someone is bound to raise his hand and respond to the situation. Cricket-lovers will feel that the encounter has already begun, what with newspapers and TV channels reporting statements and counter-statements by players of both sides. Frankly, these are just gimmicks. They don’t make the slightest difference to those who have made it to the highest level. What matters is performance on the field. Australian opener Matthew Hayden has hit three hundreds, including smashing the fastest in tournament history in the 83-run win over South Africa in a group match in St Kitts. Hayden leads the list for most runs in the tournament and skipper Ricky Ponting shares the second spot with South Africa number three Jacques Kallis. Smith said the key would be taking early wickets because the Australian batting line-up ran deep. “Hayden especially upfront has been phenomenal throughout. We will look at those things and come up with a game plan on how we can get into the middle order as quick as we can,” he said. Smith is hoping to overcome a knee injury before the semifinal after curtailing his training on Monday. The 26-year-old was not sure teams could post huge totals at the Beausejour Stadium after Australia amassed their Cup record 377 in the tiny St Kitts ground against South Africa. Smith said South Africa no longer carried the scars from their 1999 Cup elimination after a dramatic tie against eventual winners Australia. 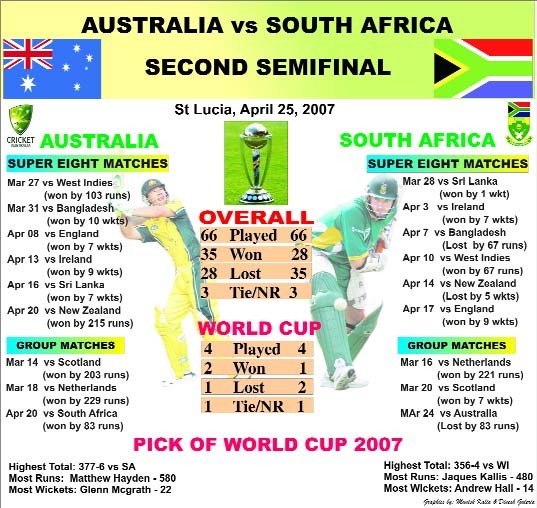 South Africa, dubbed Cup chokers for caving in under pressure, were also eliminated in 2003 at home after the team had misread the Duckworth-Lewis form in a rain-hit first-round game against Sri Lanka and were left one run short of victory. The players were keen to perform better than hope to get lucky, Smith added. “You got to make your own luck and hopefully on Wednesday we can make our own luck by playing good cricket,” Smith said. “Things start to go your way when you put teams under pressure, when you got them on the back foot. A day after constituting a seven-member panel to pick Greg Chappell's successor, the BCCI said it was yet to zero in on possible candidates for the job but has decided to give the new appointees a couple of years to work with the team. "We have formed a panel under BCCI president Sharad Pawar with three former captains (Sunil Gavaskar, Ravi Shastri and Venkat Raghavan) and office bearers. We will start working immediately after the World Cup and appoint a new manager and coach for a tenure of two years," BCCI secretary Niranjan Shah, who is currently in Kingston, told NDTV. "We will see who all are available for the job after the World Cup is over," he said. Though Bangladesh coach Dav Whatmore and Sri Lanka coach Tom Moody are said to be front runners for the job, Shah maintained the BCCI would initiate the search only after the World Cup final. It turned out to be a quiet birthday for the champion batsman who spent most of the day indoor with his family and close friends. Tendulkar has been 'rested' along with another former captain Sourav Ganguly for next month's one-day series in Bangladesh by the selection committee when the team was announced last week following the World Cup debacle, a decision which has triggered various interpretations in the media. The sands of time seem to be catching up with Tendulkar with a question mark hanging over his international career which has been nothing short of spectacular so far. Age coupled with a spate of injuries to back, ankle and elbow, seems to have diminished the all-time great player's powers as an attacking batsman feared by bowlers all around the world. But Tendulkar is still a world class player in both forms of the game and his decline as a batsman - though palpable going by statistics - still show him to be good enough to command a place in the Indian team which was struggling to maintain consistency. Tendulkar, who performed poorly like so many of his team-mates in India's disastrous World Cup campaign in the West Indies, has scored only four hundreds in his last 50 ODIs, as compared to his overall tally of 41 in 384 ties while his average during this period - just under 40 — is below his career average of 44. His plunging Test career graph is more glaring. In the last 20 Tests, the man with the most number of centuries has scored only two three-figure innings, including an innings of 248 not out against Bangladesh when India toured their eastern neighbours in December, 2004. Current national chief selector Dilip Vengsarkar has touched a raw nerve with his recent statement that all senior cricketers, including captain Rahul Dravid, would be 'rested' for a few matches during the busy season ahead. More, while backing Vengsarkar on the issue, said the players have to be talked into such decisions. "For tours like Bangladesh, you have to rest the top players. Someone like Sachin Tendulkar who has been playing for so long, you have to talk to him and tell him to look for tough tours," the former wicketkeeper told PTI. "Players like Sachin and Anil Kumble have to be preserved for tougher tours because the wear and tear is more in their case," he added. It is worthwhile to recall Dravid's comments on the subject made, incidentally, during the Indian team's visit to Bangladesh in 2004 December. "I have never really felt the need to have a rest. I know the cricket schedule is crammed full, but if you are fit and the mind is willing, then there's really no need to rest," Dravid said then. "When you are playing Test cricket, or even international cricket for the country, you want to keep doing that. "And you always want to do well, whether you have made a hundred in the last match are in good form, or struggling and made a duck," he said. Not for him the difference between playing a number one team and the minnows. "No one innings is easier than any other. You say playing against Bangladesh is easier, but I was also out for nought in the last Test." Dravid spoke the words after he set a world record of playing in 85 consecutive Tests since making debut. 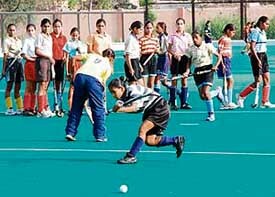 It is for the first time that Indian women hockey players have been approached to play for any overseas club. An Azerbaijan hockey delegation interacted with fifteen players having international exposure at the National Stadium in New Delhi today. Veteran player and coach at the hockey nursery here Baldev Singh is a proud man today. He informed The Tribune that former Pakistan international Tahir Zaman was in New Delhi to hire the promising players to play for the Republic of Azerbaijan in the forthcoming European Club Hockey Championship schedule to be played in Azerbaijan, sources said. Federation of International Hockey (FIH) has appointed Zaman as director of the hockey tournament to be held in Azerbaijan. Impressed with the talent here, he has reportedly come to hire these players from Shahbad. Players will be signed for five months and the organisers have also offered to bear the expenses of guardians or caretakers who wish to go along with the selected players. Baldev has trained several players of this city who have played in international and national hockey tournaments. As many as seven girls from this town were part of the 18-member Indian squad for the World Cup held last year in Madrid. “At this juncture when the performance of men’s hockey is in doldrums, Indian women hockey players have brought laurels to the country,” he said. He said the final decision will be taken in the next two days. “Playing for professional foreign clubs will definitely boost the morale of the players. Besides exposure at the international level these players will also be financially benefited,” said the coach. The ace Indian, who's away from the greens after his disappointing show at the Verizon Heritage Classic, slipped a rung to 51st with 2.26 average points. Jeev, who became the first Indian play at the Augusta Masters earlier this month, has failed to reproduce the same form which earned him four titles across three tours last year. Meanwhile, another Indian in the top 100, Jyoti Randhawa was static at 88th spot although he registered a drop of two percentage points (.02) and now has 1.52 average points. Meanwhile, Orlando-based Arjun Atwal, who's enduring a horrid time on and off the greens, was further down at 363rd spot with 0.44 average points. with 0.46 average points. Atop the chart, American Tiger Woods (20.16) held the numero uno position for 440th week extending his lead over compatriot and number two Jim Furyk to 12.11 average points. The Indian outfit was hit hard by two strikes in quick succession from Chun Bong Law in the 21st and 23rd minutes. Mahindra’s Ghanaian star Yusif Yakubu pulled one back in the 68th minute, but it was not enough to avoid their first defeat in the competition after three straight victories. Negi, who had showed flashes of brilliance in his fifth round match where he shocked defending champion Jan Timman, showed a pale shadow of himself against the Swede. Playing with black pieces, he messed it up in the middlegame ceding advantage to the local favourite, who had started with sacrificing a piece for three pawns in a sharp Najdorf variation. The 14-year-old Indian tried desperately to salvage the situation but ultimately surrendered after the 43rd move.